This post comes from "sunny California," where I'm currently bundled up in an enormous sweater with my heater turned on. What the hell? The glorious days of Summer seem to have evaporated — almost as quickly as it arrived. We had one glorious day of sunshine on July 1st . . . and then June Gloom came back with a vengeance. In fact, it's worse than June Gloom. It's downright cold. Today's high was 61 degrees for goodness sakes! And mind you, the poor folks in the Northeast are in the midst of a heatwave. I don't know where you stand on global warming, but clearly something's out of whack. I'm very grateful, though, the sun did show up for a few hours over the weekend, which was just enough time to fit in a BBQ dinner. 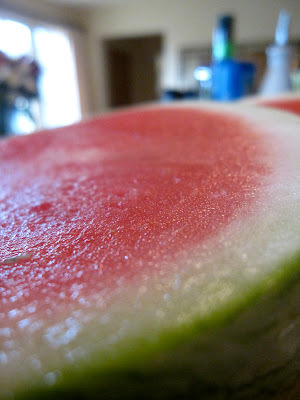 I invited some friends over and had grand visions of us taking refuge from a scorching Summer day while floating on rafts in the pool and sipping watermelon margaritas before moving on to ribs and then basking in the glow of the setting sun with full tummies and slight sunburns. I'm "an organizer" by nature and get a bit stressed when things don't go according to my plan. Living in California has mellowed me out some, but still I was getting anxious when it was 4:30 PM and the sun had yet to make an appearance. 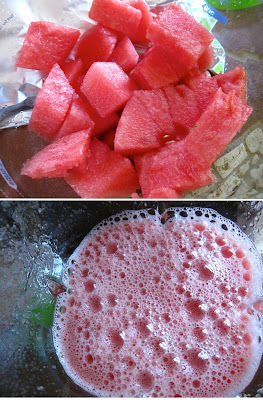 I reluctantly put away the umbrellas, but in an act of weather defiance I whipped up a batch of watermelon margaritas. No lie, seconds later the clouds parted and made room for the sun. Smart sun. Those margaritas were not to be missed! Independence Day always makes me proud to be an American — and want to eat very American food. For me that's slow-cooked ribs, potato salad and cole slaw. 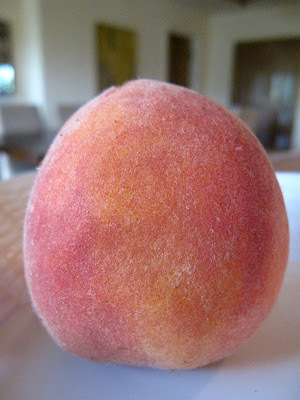 And since it's (allegedly) Summer, peaches have to be in the mix. I added some pimento cheese dip to start with (a Southern staple at any party!) and threw in some Bourbon in the dessert, because a good Southerner is always looking for an excuse to enjoy Bourbon. For a Type A personality, it's surprising that I gravitate to trying new recipes when entertaining, but I often do. My recent grilling initiation gave me the confidence to try ribs. I figured it was pretty impossible to screw up slow-roasted pork. Slather on some sauce and it had to be a winner. It definitely was. The meat literally fell off the bones. I had to leave the racks in tact because I couldn't even transfer them to the platter without the meat sliding off. I was a little skeptical about the sauce because I'm not from Texas or Kansas so tomato-based sauces can be off-putting, but this had real depth and tanginess. Not too sweet at all. By the time dessert rolled around, we were too cold to sit outdoors and enjoy the buttermilk pudding cakes with bourbon peaches. But I realized if you could at least share beautiful summertime ingredients with good friends — even if bundled in jackets indoors, it's pretty close to perfect. Note: This is a fabulous cookbook! I bought it as a thank you present for a friend, but ended up keeping it for myself. I've never made a recipe that hasn't turned out fabulously delicious — and with little effort. And it's chock full of endearing stories to make anybody wish they'd been born a Southerner — or find a way to get there as quickly as possible. In a small saucepan, combine the tomatoes, onion, garlic and red pepper flakes. Simmer over medium-low heat until reduced in half. The recipe says this takes about 15 minutes, but it took me more like 30. Stir in syrup, soy sauce and tomato relish (if desired). Preheat oven to 300 degrees and line a 9x13 -inch baking dish with foil. Place the bay leaves in the bottom of the dish. Season the ribs with salt and pepper or a little grilling spices and arrange in the baking dish. Pour half of the sauce over the ribs, turning a few times to coat. Cover tightly with foil and refrigerate the remaining sauce. Bake for 3 hours. Remove the foil and pour the remaining sauce over the ribs. Return to the oven and bake uncovered for an additional hour, or until the sauce is a thick glaze and the meat is tender. Remove the ribs to a serving platter and let stand 15 minutes. Ladle off any accumulated fat by tilting the pan carefully and spooning it off. Remove the bay leaves and pour the remaining pan sauce into a small saucepan. Bring to a steady boil and cook until reduced by half, about 15 minutes. Pour over the ribs or serve along side in a separate bowl. Yield: 4 generous servings. Note: The ribs can also be made the night before and then warmed over indirect heat on the grill the next day. I used the left over bourbon peaches on a pork tenderloin I made a few nights later and it was awesome. Thanks for all the delicious grub! Wow, thanks to Mikana Love from Santa Barbara, I found your site, the recipes are great. My dad is from Kentucky and I am always trying to find southern recipes to fix him for special occasions! I have now marked your site as a 'favorite' Thanks for all the great thoughts!